Sidewinder Shifter - The ATI / Winter's Shifter is a gate type shifter with extremely smooth action. High quality components are used throughout the shifter, including the Morse cable. The kit may be used with any transmission, 2-speed or 3-speed, with just a gate plate and hardware kit. Shifter assembly is 15.25" long, 5.5" wide and 9.25" tall. Shift Shaft Kit - Shift shafts in T400 transmissions can become corroded in harsh environments. 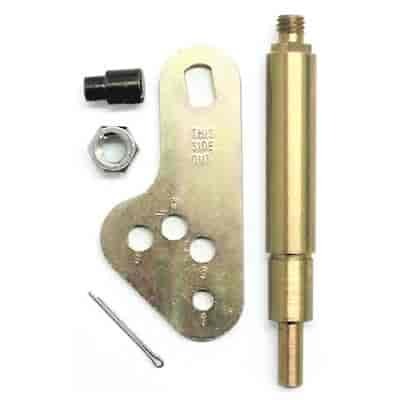 This direct replacement piece is yellow zinc plated for maximum corrosion protection. Includes serrated flange nuts for improved holding capacity. Universal Shifter Lever Kit - For use on aluminum Powerglide racing transmissions without the throttle lever and shaft. A two-piece lever rather than the usual one-piece unit. Containing four holes for the cable swivel, this lever can be used with a variety of shifters. Neutral Safety Switch & Assembly - Allows your vehicle to start only in Neutral or Park. By disabling the starting circuit, this safety feature prevents accidentally starting the car in gear which could result in damage or personal injury.